The Virgin Mary In The Light Of The Word Of God is an informative book that presents insight from Scripture about the honour due to Blessed Mary, the Mother of Jesus. This book fills a tremendous need for a concise, elegant, Biblical treatment of Mary. Dr. Labib, as he is affectionately known, gives Mary her due full honor while fending off the many faith-damaging myths perpetuated about her. 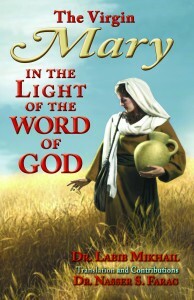 The book is a balanced and Biblical portrait of the Virgin Mary. It is a relevant study clarifying Mary’s role and significance. I found the book to have many biblical references and they were an enjoyment to read, as well as the side stories concerning the thoughts and actions of those involved. Like how Mary came back from her cousin Elizabeth's three months pregnant after newly marrying Joseph, who, upon hearing this, secretly asks for a divorce. However, before the paperwork can be drawn up, an angel appears before Joseph who explains the who situation to him and he is relieved. I did enjoy all those anecdotes dispersed throughout the pages, however, I had serious problems reading about Mary in the light in which Dr. Labib has written her. It was rather disturbing, for myself personally, I have no other Gods before me but the one true God, I do not believe in prophets nor do I hold much stock to the bible other than a great historical reference. And to read of Mary in such a light, was almost sacrilegious in my honest opinion. However, my religious viewpoints are not at question here, the works of Dr. Labib is and for the information the book shares would make a great gift for your loved one questions about the Virgin Mary and/or if you are a devout Catholic or religious person who believes in the Holy Trinity, then you will thoroughly enjoy this book. Thanks for taking the time to review this book. We appreciate you sharing your thoughts.